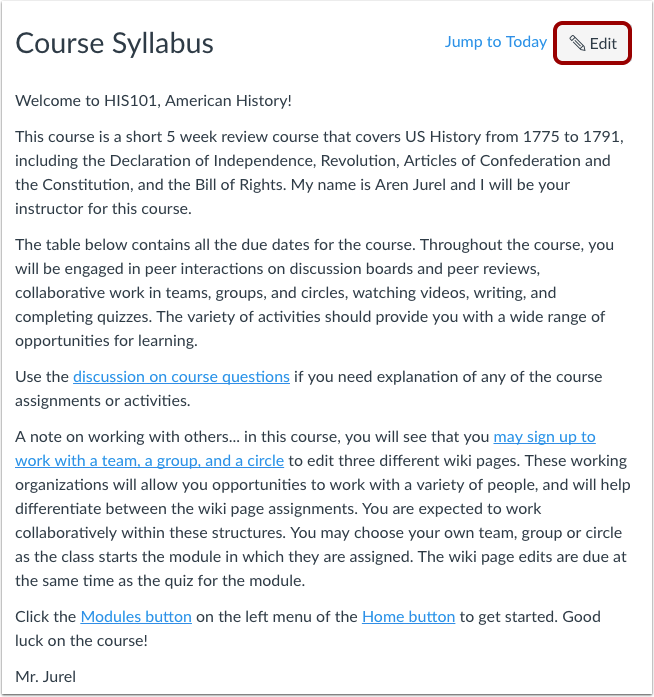 The Syllabus in Canvas makes it easy to communicate to your students exactly what will be required of them throughout the course in chronological order. You can also set the syllabus as your course home page. You can choose to make your syllabus public so that people who aren't enrolled in your course can view more information about the course. A public syllabus can be viewed as part of a private course when you send a link to a student, or if the course is listed in the public course index. The Syllabus is automatically generated based on Assignments and Events within a course. It can only be changed by editing or deleting the Assignments or Events. All assignments (unpublished and published) are listed in the syllabus for instructors. In Course Navigation, click the Syllabus link. The syllabus includes the syllabus description , the syllabus table , and the sidebar . The syllabus description is where you can post your course description, a brief introduction, class guidelines, weekly reminders, and other important information. You can copy content from Word documents directly into the Rich Content Editor or create original content inside of the Rich Content Editor. 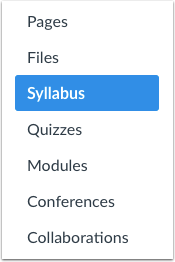 You can also link to your Syllabus by uploading it into Course Files as a PDF and linking it in the content selector. Canvas will automatically create a preview of your document so your students don't have to download it before reading it. To edit the Syllabus, click the Edit button. The Syllabus is automatically generated for the course and contains a list of assignments and events. 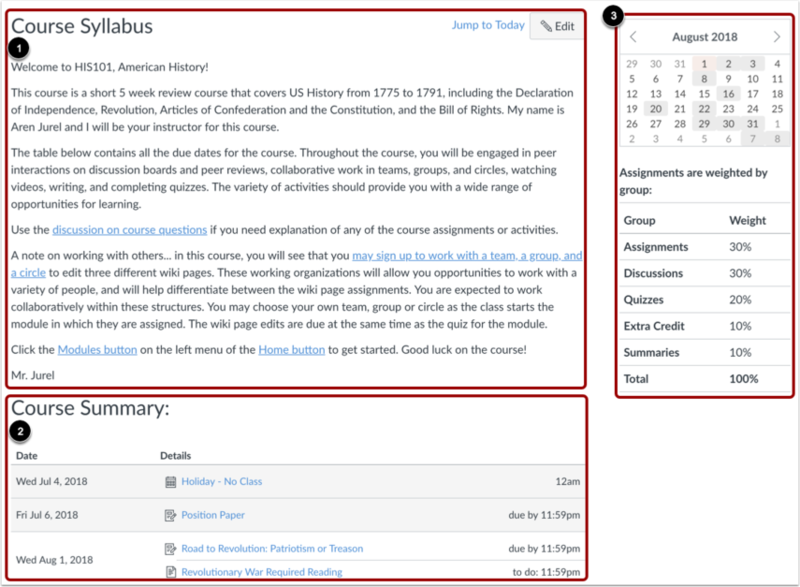 Assignments are indicated by the Assignments icon , and events are indicated by the Calendar icon . Non-graded items with a to-do date show the to-do date in the syllabus . All assignments (unpublished and published) are listed in the syllabus for instructors, but students only see published assignments. Changes to these dated events can be made in both the Assignments and Calendar features and will be automatically updated in the Syllabus. Click the title to view the details of the assignment or event. Any assignments or events that are past the due date are highlighted in gray. Undated items are listed in alphabetical order . If you have set a specific time zone in your User Settings, all course dates and times will display in your local time, but if you hover over the time, you can also see the course date and time. The sidebar section displays information about course events and grading. 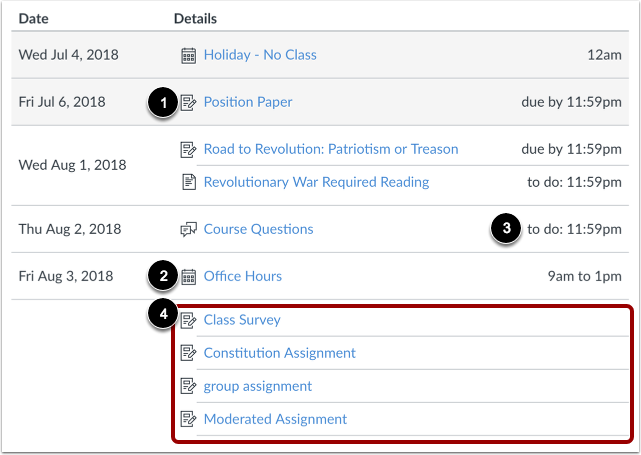 The assignment group information can be edited in the Assignments feature while the Calendar information can be edited in both the Assignments and Calendar features. Any changes made will be reflected in the Syllabus. The sidebar includes a mini calendar . Any date that includes an event or assignment due date are shown with a gray background. To view an associated assignment or event in the Syllabus table, click the calendar date. 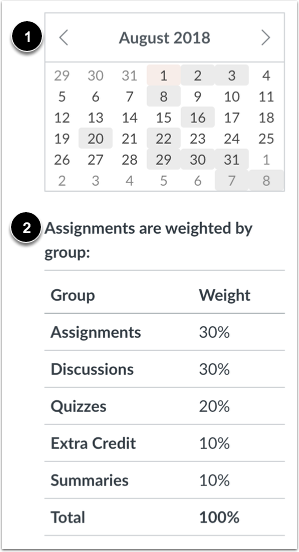 If your course includes weighted assignment groups, the sidebar also shows the percentages of each group . Previous Topic:How do I use the Course Activity Stream as an instructor? Next Topic:How do I edit the Syllabus description in a course? Table of Contents > Course Navigation > How do I use the Syllabus as an instructor? Re: How to upload syllabus?